Dan Lewis' wildly-popular daily trivia Now I Know newsletter is expanding its presence to YouTube. 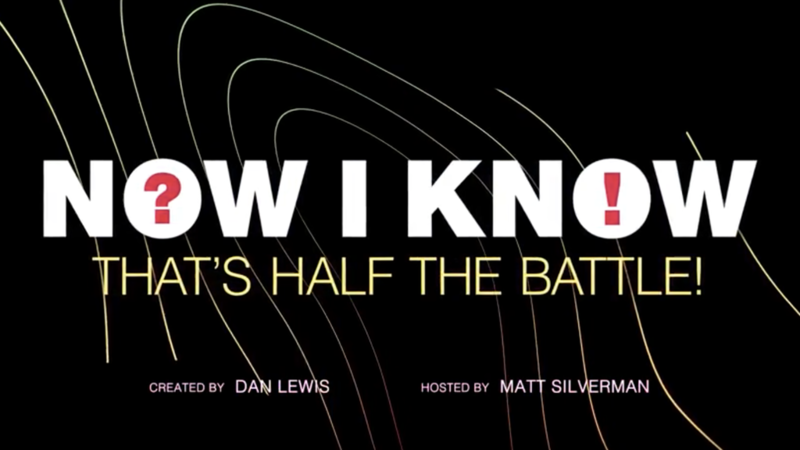 Yup, he's bringing us a Now I Know webseries. Dan himself is not an "on-air" kind of guy, so he brought on Matt Silverman to star in the videos. I’ve written more than 1,000 surprising, strange, and interesting stories over the years and I’m always looking for other ways to spread the fun. Like the two books and even one of those fact-a-day calendar things. But video? That’s been a struggle. I’m not a video producer and in any case, it takes a ton of time to publish the email newsletter. So I can’t do this myself. I’ve talked to a lot of promising collaborators over the years, but those would-be channels all fizzled. Except for this one -- if you help out. Here's a video about the channel, and you'll see that it isn't me hosting. That's Matt Silverman, a friend of mine who makes awesome videos on the Internet.